The fellows matched with Splash will spend 26 days immersed in the digital media industry to help them create their own effective digital media business models. By immersing ICFJ fellows with the latest digital trends, Splash Media has played a crucial role in promoting partnerships and exchanges on an international scale. 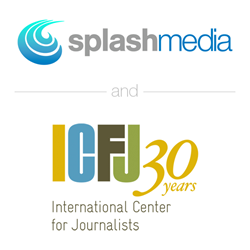 Splash Media is pleased to continue its international work by hosting two professional fellows through the International Center for Journalists (ICFJ) and the U.S. Department of State. The International Center for Journalists has worked to empower journalists from around the world with cutting-edge technologies and best industry practices for over 30 years. More than 87,000 journalists and media managers from 180 countries have received training and assistance from the ICFJ. The exchange program is organized by ICFJ and funded by the U.S. Department of State through its Professional Fellows Program. This year’s theme is “A Digital Path to Entrepreneurship and Innovation for Latin America.” The goal of the program is to develop new and effective digital media business models in Brazil, Colombia, Guatemala, Honduras and Nicaragua. This year, Splash Media is hosting two international fellows: Daniel Perez Suarez, a data journalist from Colombia and Yamil Gonzalez, a digital developer and designer from Honduras. Daniel has covered the Colombian conflict from the front lines and worked with start-ups, while Yamil has worked as a graphic designer and web developer, college lecturer and event planner bringing digital events, such as TEDx, to his community. During their time at Splash Media, Daniel and Yamil will shadow employees to learn the agency structure and workflow as well as social media marketing best practices. They will also assist with special projects and international research to help foster relationships and understanding that cross geographical and cultural boundaries. Splash Media has been involved in the ICFJ exchange program through the U.S. Department of State over the past year and a half, first hosting international fellow Taha Amiar from Morocco in the spring of 2014, then sending Dennis Wilson, director of production services, to Morocco in the fall of 2014 for “Unlocking the Economic Potential of Digital Media.” These experiences were informative, educational and memorable for both traveler and host and have spurred Splash Media’s international growth and development. Based in the North Dallas suburb of Addison, Texas, Splash Media Group has leveraged its expertise in video and television production since 2005, and launched a social media practice in 2010 that has evolved into one of the leading social media agencies in the world. Splash Media Group provides comprehensive social media services from consulting to full outsourcing. Services include online marketing strategy development, online reputation management (ORM), search engine marketing (SEM), search engine optimization (SEO), community management, content marketing (video and blog creation) analytics/reporting, paid media and PPC just to name a few. For more information, visit http://www.splashmedia.com. The International Center for Journalists (ICFJ) is at the forefront of the news revolution. Its programs empower journalists and engage citizens with new technologies and best practices. ICFJ’s networks of reporters and media entrepreneurs are transforming the field. ICFJ believes that better journalism leads to better lives. For more information, visit http://www.icfj.org.